repetitive tasks of any desktop or web-based applications with minimal effort. Augment your own work by automating time consuming, repetitive tasks and free up valuable time for more value-added activities. WinAutomation can automate simple administrative tasks, involving simple data transfer between systems, to complex business processes and workflows. 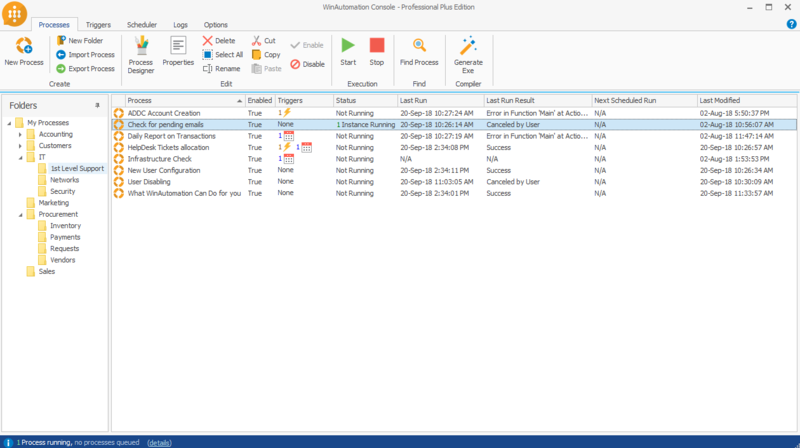 Interact with any Desktop or Web Applications, send e-mails, work with all kinds of documents and folders, search for images on the screen, work with FTPs, databases, MSOffice products and much-much more. WinAutomation makes it easy for any professional to build automations. Automate your computer-tasks through the most easy-to-use and intuitive design environment. 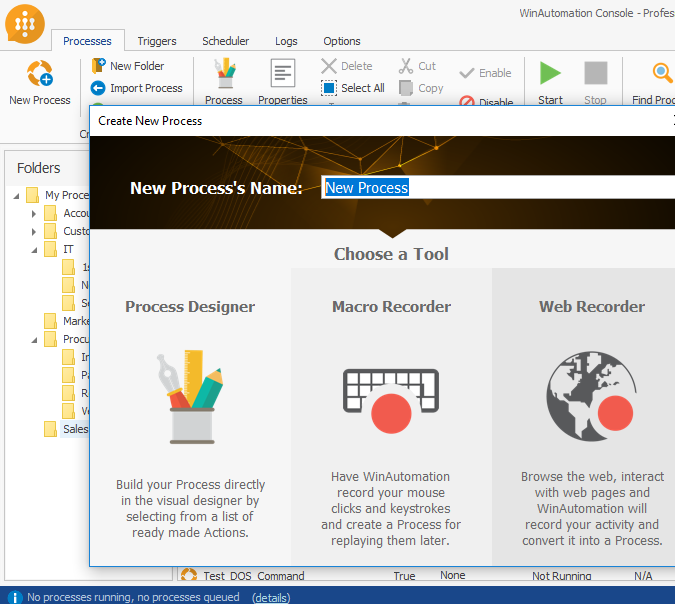 WinAutomation is quick to learn for beginners (non-programmers), while providing complete control and flexibility for advanced users, programmers and developers. 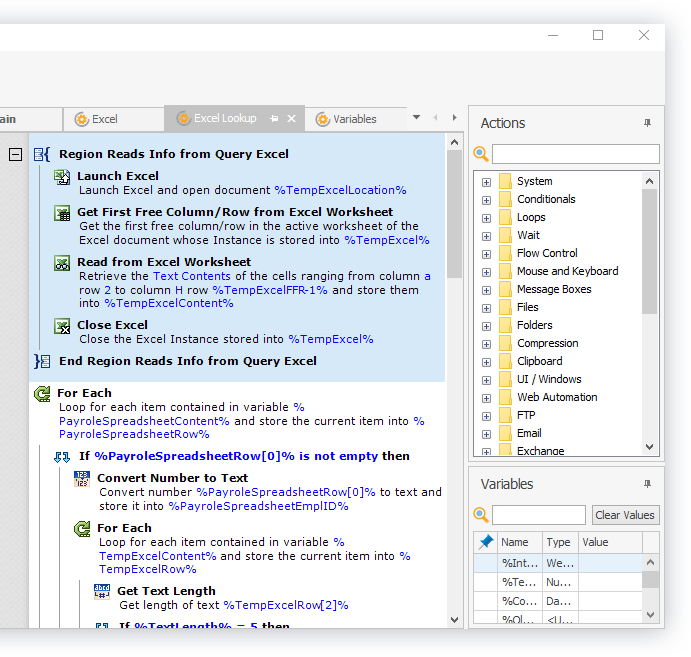 Build processes without requiring to write a single line of code. Develop from scratch with the drag-and-drop user interface, or use the Macro Recorder and Web Recorder to automate workflows based on your day-to-day activities. Develop, configure, troubleshoot and test a Process without requiring programming skills or a technical background. Manage, review and control all aspects of your automations, Process properties and security settings through a single interface. WinAutomation gives users a vast range of options to customize the execution of processes to fit your working-style, whilst ensuring compliance with your organizations IT governance practices. Get more done by running processes in parallel (Multitasker), or setup Triggers/ Schedule to execute processes in the background. Allow WinAutomation to work on your behalf in UnAttended mode, and use Logs and exception handling alerts to debug or configure processes behavior in unexpected scenarios.